We’d love your help. Let us know what’s wrong with this preview of The Age of Radiance by Craig Nelson. A riveting narrative of the Atomic Age—from x-rays and Marie Curie to the Nevada Test Site and the 2011 meltdown in Japan—written by the prizewinning and bestselling author of Rocket Men. Radiation is a complex and paradoxical concept: staggering amounts of energy flow from seemingly inert rock and that energy is both useful and dangerous. While nuclear energy affects our e A riveting narrative of the Atomic Age—from x-rays and Marie Curie to the Nevada Test Site and the 2011 meltdown in Japan—written by the prizewinning and bestselling author of Rocket Men. Radiation is a complex and paradoxical concept: staggering amounts of energy flow from seemingly inert rock and that energy is both useful and dangerous. While nuclear energy affects our everyday lives—from nuclear medicine and food irradiation to microwave technology—its invisible rays trigger biological damage, birth defects, and cellular mayhem. Written with a biographer’s passion, Craig Nelson unlocks one of the great mysteries of the universe in a work that is both tragic and triumphant. From the end of the nineteenth century through the use of the atomic bomb in World War II to the twenty-first century’s confrontation with the dangers of nuclear power, Nelson illuminates a pageant of fascinating historical figures: Enrico Fermi, Marie and Pierre Curie, Albert Einstein, FDR, Robert Oppenheimer, and Ronald Reagan, among others. He reveals many little-known details, including how Jewish refugees fleeing Hitler transformed America from a country that created light bulbs and telephones into one that split atoms; how the most grotesque weapon ever invented could realize Alfred Nobel’s lifelong dream of global peace; how emergency workers and low-level utility employees fought to contain a run-amok nuclear reactor, while wondering if they would live or die. To ask other readers questions about The Age of Radiance, please sign up. Nelson has written a readable overview of the atomic age thus far. Readers not familiar with the story will enjoy the book - it's easy to read and digest, it follows a logical progression, and it engages the reader. Those familiar with the science, however, will bristle. There are errors of minutiae and there are editorial decisions made for drama's sake rather than firm accuracy: I am very familiar with the unit REM but have never seen it defined as 'a measure of the cancerous effects of radian Nelson has written a readable overview of the atomic age thus far. Readers not familiar with the story will enjoy the book - it's easy to read and digest, it follows a logical progression, and it engages the reader. Those familiar with the science, however, will bristle. There are errors of minutiae and there are editorial decisions made for drama's sake rather than firm accuracy: I am very familiar with the unit REM but have never seen it defined as 'a measure of the cancerous effects of radiant energy'. Nelson freely admits his former ignorance concerning radiation. Maybe that is why he refers to its 'mythic' properties though it is well understood by science. I very much like his explanations about how, rather than something rare and obscure, we are quite literally bathed in the stuff and, in fact, are radioactive sources ourselves. I bothers me that he presents statistics as certainties and conjecture as fact. But there is much to like here and he makes no pretense that he writes a physics textbook. I admit that whenever I hear words like "enriched uranium" or "thermonuclear fusion" my eyes glaze over, so a book about atomic energy is probably the last thing I would have thought to find on my reading list. But "The Age of Radiance" is an excellent book that offers a fascinating overview of the history of the atomic age, written so that it's comprehensible even to a non-science person like myself. In it we find the key players in the foundation of atomic energy, from the beautiful Marie Curie I admit that whenever I hear words like "enriched uranium" or "thermonuclear fusion" my eyes glaze over, so a book about atomic energy is probably the last thing I would have thought to find on my reading list. But "The Age of Radiance" is an excellent book that offers a fascinating overview of the history of the atomic age, written so that it's comprehensible even to a non-science person like myself. The Age of Radiance does a much better job of explaining the personalities that went into the discovery of nuclear science. Curie, Meitner, Fermi, Szilárd, Teller, and Oppenheimer all receive more lifelike treatment compared to any other book I've consumed on the topic. Considerable effort it made to straighten out the missing history of Lise Meitner's work in the wake of Otto Hahn and I hope this starts a trend to rehabilitate her legacy. The chemistry isn't gone into in huge detail but the proc The Age of Radiance does a much better job of explaining the personalities that went into the discovery of nuclear science. Curie, Meitner, Fermi, Szilárd, Teller, and Oppenheimer all receive more lifelike treatment compared to any other book I've consumed on the topic. Considerable effort it made to straighten out the missing history of Lise Meitner's work in the wake of Otto Hahn and I hope this starts a trend to rehabilitate her legacy. The chemistry isn't gone into in huge detail but the process is. The day-to-day of what working with radium, thorium, and uranium looked like and how a combination of insight and determination forced nature to yield her secrets. This is a really great book. Unfortunately, at the end the author spins into a little bit of a political whirlwind, that ends up making very little sense to me. He's pretty balanced up to that point. Other complaints: He really skips over most of the Cold War and doesn't go into the politics of nuclear weapons design (or tactics/strategy) in as much detail as I would have liked. However, his treatments of the European pre-Manhattan-Project and North American Manhattan-Project eras are really grea This is a really great book. Unfortunately, at the end the author spins into a little bit of a political whirlwind, that ends up making very little sense to me. He's pretty balanced up to that point. However, his treatments of the European pre-Manhattan-Project and North American Manhattan-Project eras are really great. So is his coverage of the early days of radiation research. Skimmed and abandoned. The author's anti-nuclear and anti-American prejudices are obvious, and he twists history into pretzels to fit his preconceptions. This is based on skimming areas that I know pretty well, so take with a grain of salt. But life is short, books are many, and Mr Nelson's opinions are of little or no interest to me. Two things I would say will help dictate whether you are likely to enjoy the book “The Age of Radiance: The Epic Rise and Dramatic Fall of the Atomic Era” by Craig Nelson. The first and most obvious is whether you have interest in the subject matter of learning about the sweeping history of the atom, radiation and nuclear weapons, power, and medicine. The second reason is if you like the style of historical writing that is used by author Craig Nelson. The style that Nelson uses and which is not Two things I would say will help dictate whether you are likely to enjoy the book “The Age of Radiance: The Epic Rise and Dramatic Fall of the Atomic Era” by Craig Nelson. The first and most obvious is whether you have interest in the subject matter of learning about the sweeping history of the atom, radiation and nuclear weapons, power, and medicine. The second reason is if you like the style of historical writing that is used by author Craig Nelson. The style that Nelson uses and which is not unique to him is to make liberal use of quotes normally from people involved or who lived through the events described. Nelson likes to construct his story with a smaller mixture of his telling of events and then more weighted towards his use of quotes. If you like hearing more directly from the people involved then you will be more inclined to like this book given that is the style it uses. From the Curies to today's shrinking nuclear arsenal and fading nuclear energy, Nelson describes the rise and fall of nuclear energy. Using a slightly sarcastic tone - which seems right - he describes the discoveries, the spending, the horror and the wonder of nuclear energy. The atomic bomb turns out to be more effective when not used and nuclear energy scares everyone because they think of the bomb. Great writing, very thought provoking. If gasoline start From the Curies to today's shrinking nuclear arsenal and fading nuclear energy, Nelson describes the rise and fall of nuclear energy. Using a slightly sarcastic tone - which seems right - he describes the discoveries, the spending, the horror and the wonder of nuclear energy. The atomic bomb turns out to be more effective when not used and nuclear energy scares everyone because they think of the bomb. Great writing, very thought provoking. From Marie Curie to the Fukushima disaster, this book packs in tons of characters and facts about the history of nuclear science. The biographies of Curie, Teller (Dr. Strangelove), Fermi, Oppenheimer, etc... were super interesting. It was a bit disturbing to read about the stupidity of various governments and corporations in their handling of nuclear power during the cold war and nuclear disasters like Chernobyl. I was a little intimidated when I won this from a Goodreads giveaway because of th From Marie Curie to the Fukushima disaster, this book packs in tons of characters and facts about the history of nuclear science. The biographies of Curie, Teller (Dr. Strangelove), Fermi, Oppenheimer, etc... were super interesting. It was a bit disturbing to read about the stupidity of various governments and corporations in their handling of nuclear power during the cold war and nuclear disasters like Chernobyl. I was a little intimidated when I won this from a Goodreads giveaway because of the technical subject matter, but it was a smooth, well-written and extremely interesting read. Based on the WSJ review, I was expecting a well organized history of the atomic age. Instead, the book is a study in cognitive dissonance as it vacillates between anti-nuclear screed and anti-hysteria propaganda. Splitting the atom is bad. Radiation exposure is not horrific. Coal is worse than nuclear power plant meltdowns. I grew bored about half way through the book. This book was dense, packed to every margin with details. It’s to the point that it can be overwhelming and isn’t a book that I would want to sit down and read in a day. The level of detail is what makes this book a valuable read for any person studying the history of nuclear science. There are a ton of historical figures to sort through and I never confused any of them which is all credited to the author. The places where women’s contribution to nuclear science were spotlit were some of my favorites. However, the detail does drag down the book in places. Perhaps the author used too few chapters and not enough mid-chapter breaks. Sometimes, I’d be in Los Alamos and then in the next sentence, I’d be flung to Russia to survey what the equivalent Russian physicists were doing. There were a number of places like this, where I felt jolted around historically. One of the other reasons I could not give this book five stars was the inconsistent use of block quotations. The author embeds many, many lengthy quotations in long paragraphs. Sometimes there are two different people who are quoted, but these are not separated out. I felt like this made some of the text very clunky when I would lose track of where quotes began and ended. Don't read this book. The historical information about the first half of the 20th century may be correct, though differs in many placed from more reliable sources (e.g., Richard Rhodes Making of the Atomic Bomb). The latter stages are related to Chernobyl and Fukushima, and include innumerable mistakes (and several typos) and exaggerations. The only nuclear engineer quoted regarding Fukushima is David Lochbaum, the head nuclear engineer at the staunchly ANTInuclear Union of Concerned Scientists. Don't read this book. The historical information about the first half of the 20th century may be correct, though differs in many placed from more reliable sources (e.g., Richard Rhodes Making of the Atomic Bomb). The latter stages are related to Chernobyl and Fukushima, and include innumerable mistakes (and several typos) and exaggerations. The only nuclear engineer quoted regarding Fukushima is David Lochbaum, the head nuclear engineer at the staunchly ANTInuclear Union of Concerned Scientists. UCS reports are also quoted, as is NRC Chairman Gregory Jazcko, who was later shown to be entirely wrong in his assertion the US Congress the the Unit 4 spent fuel pool was completely dry. All of the anti-nuclear grandstanding is counterbalanced by almost a page detailing the hard facts of the extremely limited cancer rates associated with Chernobyl. De-emphasize the facts and scientific data if they don't fit the narrative you want to spin. I also enjoyed his implied criticism of Japanese dose standard reported as 250 millisieverts in 5 years as compared to the US standard of 50/year. I can attest to the US standard at least being correctly reported. If you, however, multiply out the US standard to the same 5 year period you get the exact same 250 mSv dose. I can only assume the author was relying on American innummeracy to fail to notice the equivalence of the two standards. 1. I finally have learned who Oppenheimer, Teller, and Fermi are. 2. Fukushima and Chernobyl seemed really bad at the time, but have not had many deaths resulting. 3. Most people don't want any part of nuclear; not weapons, not peacetime uses, not power plants. 4. The story of the radioactive boy scout and his admirer was great. Chock full of history I never imagined...brilliant descriptions of Chernobyl and Fukujima. History the way it ought to be written for the general public. Very interesting historical view of the atomic age. A good read. This book is a very useful companion piece to another book I've reviewed her, 'The Dead Hand'. While this is not quite so comprehensive as that latter work, it does go into some very good detail on specific areas and developments that need a fuller treatment there. It also covers in great detail the Daiichi tsunami of 2012, which was beyond the chronology of 'The Dead Hand'. When I started this book, I hoped it would give more of the history of science and technology of the 'atomic age', and in t This book is a very useful companion piece to another book I've reviewed her, 'The Dead Hand'. While this is not quite so comprehensive as that latter work, it does go into some very good detail on specific areas and developments that need a fuller treatment there. It also covers in great detail the Daiichi tsunami of 2012, which was beyond the chronology of 'The Dead Hand'. When I started this book, I hoped it would give more of the history of science and technology of the 'atomic age', and in that I wasn't disappointed. Nelson goes into great and clarifying detail about each step along the road to the development, first, of nuclear weapons and then later of nuclear power. In examining the Three Mile Island, Chernobyl and Fukushima disasters, he give full details about what happened, what went wrong, and the consequences of those developments, both in terms of the immediate devastation and the long-term developments. Another area that I was very happy to see was a bit of historiography regarding the German atomic bomb program during World War II. Again, offering meticulous detail, he discusses the efforts by Heisenberg and others to 'rewrite' the history of that program and German scientists' role in it. I recall reading some reviews of the books that he cites, and learning that these scientists had described their efforts to subvert development of a German bomb. I never presented that interpretation in any of the courses I taught (though, truth be told, I did acknowledge that that particular historical interpretation was out there--at least for a couple of years). It seemed simply too convenient. There's some very good historical writing about the scientists themselves: Leo Szilard and Robert Oppenheimer and their opposition to Edward Teller and his 'Super'; Ronald Reagan's fixation on Teller's 'Star Wars' (SDI). There's also the role of Lise Meitner. Because this book covers the history of science, Nelson feels he must right a great wrong and pay appropriate attention to the advances made by this remarkable woman. In terms of social history, too often she, along with Marie and Irene Curie are simply noted as being 'Women in Science' rather than acknowledging their actual contributions. Nelson covers their work and their accomplishments in detail, explaining how they built on earlier work, what insights and advances they brought to the study of the atom, and the successes they experienced. There's also some very good social history here. Bert the Turtle ('of 'Duck and Cover' fame), the bikini swimsuit, 1953's 'Picture Parade' children's book cover and children's chemistry sets from the 1950s which provided every home with its own radioactivity are all dealt with in some depth, allowing for a better understanding of the ways in which thinking about these topics have changed in the popular mind over 70 years. I got suggestions from other reviews gloss all the Cold War stuff thru the middle of the book, but I found this section worthwhile. I don't have the book to hand just now (gotta redo this), but I was alarmed to read a few parts. They all went down to the behavior of our government (USA). Well read people probably know the so-called "missile gap" was a fiction. Perhaps policymakers/military didn't know this for a fact at the time (I have doubts about that), but certainly the reaction was way out of proportion. Anyway, my thoughts aren't specifically about that missile gap, but rather the milieu of government, military, and industry during the period. They managed to align themselves into a self-reinforcing structure that did a certain limited amount of real harm to people, egregious harm in localized instances, but worse, set up a tradition of corrupt-able behavior that at the very least squanders a titanic amount of the privately generated wealth, and leads rather ultimately to a 1984-scenario if not checked. It's a bloody ratchet, click, click, click. The final section of the book discussed nuclear energy and Fukushima. It ultimately delivers a sober and balanced opinion rather optimistic of the promise of nuclear electricity generation, rightly pointing out that if the climate threat is serious, and we're actually serious about doing what we can to mitigate the potential for a bad outcome in the future, we'll simply have to learn to get comfortable with nuclear energy if we want to maintain our current standard of living and comfort with all our energy-hungry amenities. Renewables cannot work as a replacement, because they're too diffuse an energy source. It ultimately costs way too much in simple money, materials, grid-stability, etc. to pursue them vs. the total energy you can put into use. Unfortunately, this carefully considered view comes at the end of a shrill and dopey (repeating some factually inaccurate stuff--which I should cite when I redo this) tale rehashing all the radioactive fear-mongering around the Fukushima meltdowns, without bothering to dig into the details and put the radioactivity releases into context for what will be its ultimate impact on human health, locally and globally. An opportunity squandered, which is ironic considering the overall theme of the book! "The Age of Radiance" is an absolutely fascinating account of the history of nuclear energy from the early to mid-20th century until very recently. It was really amazing to me how much things have changed. You had so many scientists who put their lives on the line to study this new kind of energy that both excited and scared the world at the very same time. I really enjoyed this history. This book goes through the personalities and the events that shaped such an important way of getting energy. T "The Age of Radiance" is an absolutely fascinating account of the history of nuclear energy from the early to mid-20th century until very recently. It was really amazing to me how much things have changed. You had so many scientists who put their lives on the line to study this new kind of energy that both excited and scared the world at the very same time. I really enjoyed this history. This book goes through the personalities and the events that shaped such an important way of getting energy. The book is jam-packed with all of the personalities and events involved in the history of nuclear power. I really liked reading about some of those that had a big impact on this research. The book includes sections that are almost akin to a small biography on people such as the Curies, Oppenheimer, Fermi, and many others. I loved reading about their research and their discoveries. Nelson makes the book very accessible to all readers, not just those that have science backgrounds. 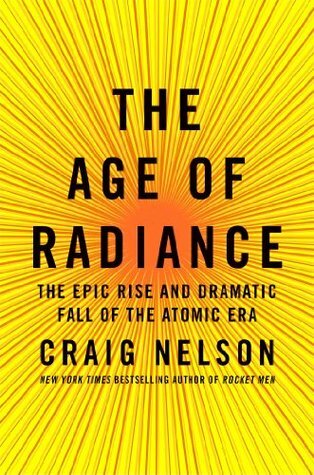 The Age of Radiance by Craig Nelson is a four part history of atomic energy. Part 1: The fundamental science from Marie Curie to Lise Meitner with a refreshing emphasis on women scientists. Part 2: Los Alamos, Manhattan Project, and the development of the A bomb. Part 3: Cold War with newly declassified information which is still frightening even after all these years, and in some place laughable. Part 4: Atomic power generation with highlighting Three-mile Island, Chernobyl, and Fukushima. Like most The Age of Radiance by Craig Nelson is a four part history of atomic energy. Like most history, this book shares a mythology with fiction: people are in charge and the consequences of their actions are critical. Homo sapien sapiens are pattern matching beings. They expect the narrative to be controlled by cause and effect, action and reaction, not randomness. This myth persists even though much of our experience is arbitrary and inexplicable. Nelson makes a strong case for Germany's loss in World War II being a direct result of antisemitism, both from Germany's loss of scientific resources, and from the actions of those angry scientists who were victims of antisemitism. This is a neat example of cause and effect like you'd find in any novel from classics to contemporaries, from literary to genre. A well-written book for those interested in the history of science and research. This is an enjoyable while dense account of mankind’s adventure on discovering and unraveling the power of atomic energy. It gives a taste of the harrowing, dangerous effort that it took to extract energy from matter, and how much of our dark side was imprinted on the results. The promise of Disney’s “Our friend, the atom” famous book, quickly turned into a sci-fi nightmare and Dr. Strangelove. The book could have been twice as long without exhausting the subject, and, I guess, the need to compre This is an enjoyable while dense account of mankind’s adventure on discovering and unraveling the power of atomic energy. It gives a taste of the harrowing, dangerous effort that it took to extract energy from matter, and how much of our dark side was imprinted on the results. The promise of Disney’s “Our friend, the atom” famous book, quickly turned into a sci-fi nightmare and Dr. Strangelove. 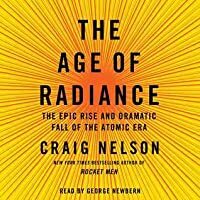 Even for The Age of Radiance by Craig Nelson is a four part history of atomic energy. Even for someone who follows this history, Nelson has uncovered plenty of new information to keep the story fresh and interesting, like backyard bombs. The carnage was so extravagant that any idea of strategy or targeting was removed; the backyard bomb of Teller's Los Alamos dreams-the one so huge and so lethal you didn't need to take it and drop it on an enemy, you could just set it off in your own backyard. The Age of Radiance is a serviceable history, but it does have a lot of flaws – mainly structural ones. The variability of chapter lengths (ranging from as short as five/six pages to as many as fifty-six!) is one such example. Other problems included an occasionally poor use of quotes (with Nelson employing paragraph-length quotes in full), inconsistent naming practices for almost everyone which make it really difficult to keep track of who’s who (for example, J. Robert Oppenheimer is referred to The Age of Radiance is a serviceable history, but it does have a lot of flaws – mainly structural ones. The variability of chapter lengths (ranging from as short as five/six pages to as many as fifty-six!) is one such example. Other problems included an occasionally poor use of quotes (with Nelson employing paragraph-length quotes in full), inconsistent naming practices for almost everyone which make it really difficult to keep track of who’s who (for example, J. Robert Oppenheimer is referred to variously as JRO, Oppenheimer, Robert, Robert Oppenheimer, and Oppie), and an unclear thesis for most of the book. I also wished Nelson delved a bit more into the actual science, explaining why things worked the way they did, rather than just describing what certain scientists discovered. The Age of Radiance is overall a very interesting and informative book. Craig Nelson provides detailed backstory on some of the forgotten fathers and mothers of the Atomic Age, but unfortunately some of the more minor characters are given no introduction at all and their abrupt drop into a storyline left me confused and searching to see if I'd missed something. On a similar note, many times I would find myself wanting to know more about a fun-fact he mentioned in passing, but never delved into. The Age of Radiance is overall a very interesting and informative book. Craig Nelson provides detailed backstory on some of the forgotten fathers and mothers of the Atomic Age, but unfortunately some of the more minor characters are given no introduction at all and their abrupt drop into a storyline left me confused and searching to see if I'd missed something. On a similar note, many times I would find myself wanting to know more about a fun-fact he mentioned in passing, but never delved into. This topic jumping packed a lot of interesting information into the book, I used up a highlighter on them, but it also caused me to set the book down and try to find more information on my phone. All in all those are very minor annoyances and I wouldn't let that stop you from reading a good book with a solid history of our Atomic Age. This is THE definitive book on the rise of the Atomic age, from before the discovery of radium through the disaster in Japan following the tsunami. There is so much detail, biographies and history that I had never heard about. Honestly, most of the specifics on the science went over my head and I struggled to get through the first part of the book. It was incredibly interesting, I just am not a chemist. The second part of the book with the rise of Nazi Germany and the impact on scientists in the This is THE definitive book on the rise of the Atomic age, from before the discovery of radium through the disaster in Japan following the tsunami. There is so much detail, biographies and history that I had never heard about. The second part of the book with the rise of Nazi Germany and the impact on scientists in the region, to the Manhattan project and Los Alamos, through the use of the atomic bombs really shone bright. Even though I knew the outcome, I was riveted. It was especially interesting to see the differences between the scientists and their views, the details of Los Alamos and the people who lived there. The book ends strong with retellings of the Cold War and then on to Three Mile Island, Chernobyl, and Fukushima. The giveaway gods are wise. Just as I reached the end of The Disappearing Spoon: And Other True Tales of Madness, Love, and the History of the World from the Periodic Table of the Elements this beauty arrives on my doorstep. What timing! It's taken me about a month to finish. Slow in parts but mostly an interesting look at the scientists, politicians and military men behind the development of nuclear science and weaponry. "...once a society reaches to sun power, and makes nuclear weapons, it dest The giveaway gods are wise. Just as I reached the end of The Disappearing Spoon: And Other True Tales of Madness, Love, and the History of the World from the Periodic Table of the Elements this beauty arrives on my doorstep. What timing! "...once a society reaches to sun power, and makes nuclear weapons, it destroys itself. That's why we feel ourselves to be alone in the universe. What we see staring at the vast night sky is not a mystery but a morgue, full of suicided civilizations." It is no easy feat to write a readable, and somewhat enjoyable, overview of the atomic age thus far. Particularly as it is a somewhat convoluted, and at times terrifying, history. And yet, Nelson has crafted such a tale, albeit it with some errors.